Earlier this month, I wrote about how much I liked the idea of flexible, modular cars, and how I thought they should, you know, exist. It turns out something very much like I was imagining did exist, at least in concept form, back in 1982. It was the ItalDesign Capsula, and I think I love it. Capsula is thought around an innovative concept: the one of the platform that includes engine, driving shaft, tank, spare wheel, trunk, servobrake, heater, optical groups. The chassis is inspired by buses and small industrial vehicles, is completely equipped and self sufficient. The compartment is a capsule applied to the chassis in a fast and easy way, and can be substituted in every moment transforming the Capsula in a commercial vehicle, or in an ambulance or in a rescue vehicle. In the berline version, the research is focused on internal compartment, bigger than contemporary VW Golf 1 and Mercedes 380SE, in just 3720 mm length. I think the end result is incredibly cool and useful. Look at the example bodies they have here — passenger cars, tow trucks, ambulances, open 'fun' cars, buses, fire trucks — this seems like it had potential to be a really useful idea. Not surprisingly, though, I seem to be in the minority here, and would have been even way back then when I was a kid. 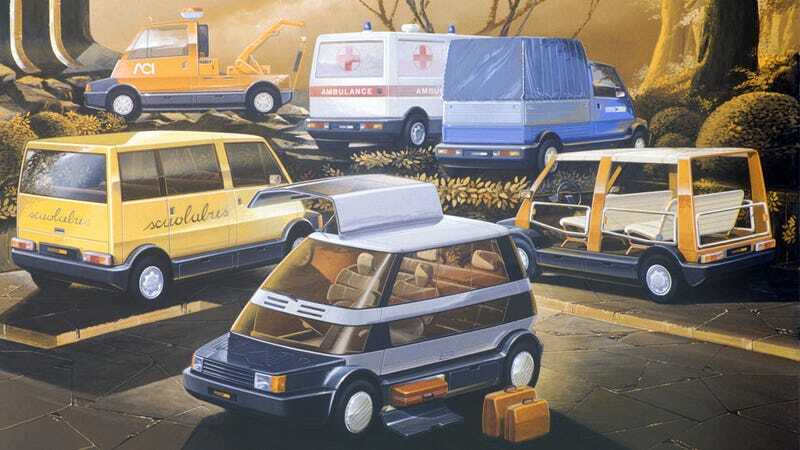 No one took up ItalDesign's idea to make a really revolutionary modular car, so those of us who still like this idea will have to keep hoping. Maybe someday we'll meet, sweet, sweet Capsula.